Thanks for looking in Mark,more soon. 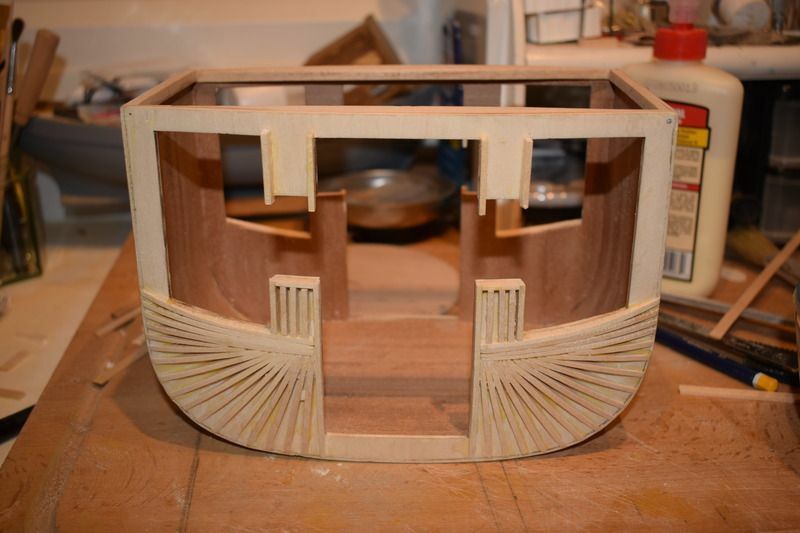 Building: Artesania Stage-Coach. H.M.S.Victory / H.M.S. Victory Cross Section / De-Agostini Spitfire. Full Kits: San Francisco. De-Ago Bremen.Sovereign of the seas. Nice to see some more progress with this one Trev, looking good mate and looking forward to your next update. Well done. Thanks Kev for looking in and your comments. You're doing a really nice job of this Trev. Top work! Hi Phil,thank you for taking the time to view my work, I am finding this a very rewarding kit to build and excellent value for money,more to follow. Hi all, time for an update, today I fitted the wall this had to be sanded be for fitting.The wall forms part of the coach structure, the first job was to moisten the area to be curved then ensure that it was well centered, then start to glue on the upper part of one of the side beams, I then left for 24 hours, if all goes well when dry and the glue has set, using a modelling saw or cutter trim off all the surplus. Nice update, certainly cracking on with it. Nicely done Trev, looks good. I thank you all for looking in,and your comments the next part will be lining the interior and floor,could be tricky keep looking. Yes indeed Trev, nice tidy work and looking good, very well done. 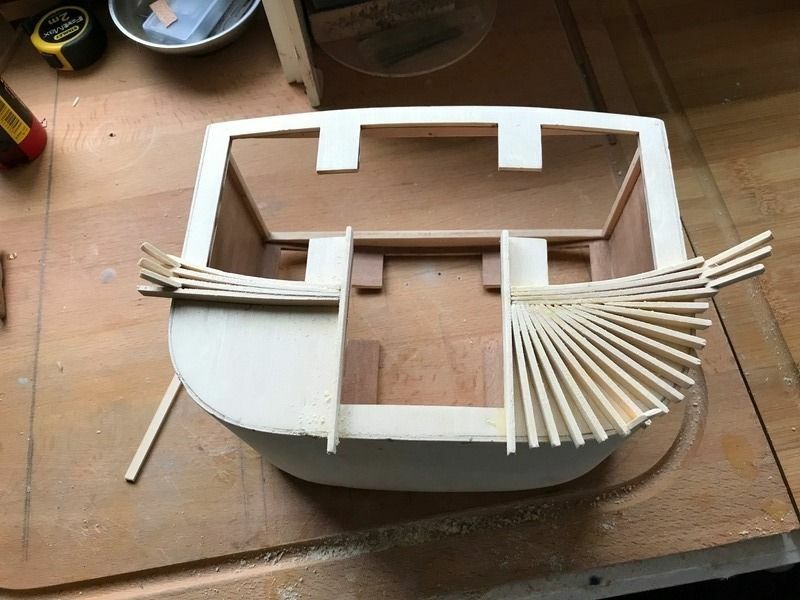 Kev: Lined the inside and started to place the battens on the front side of the box,I think it is to give a bulging effect,this will be made from 2x4 basswood you need a fast setting glue as you have to stand them on there side,more pictures soon. Thanks for looking Ian,I have worked more on the front side and will be posting pictures soon. 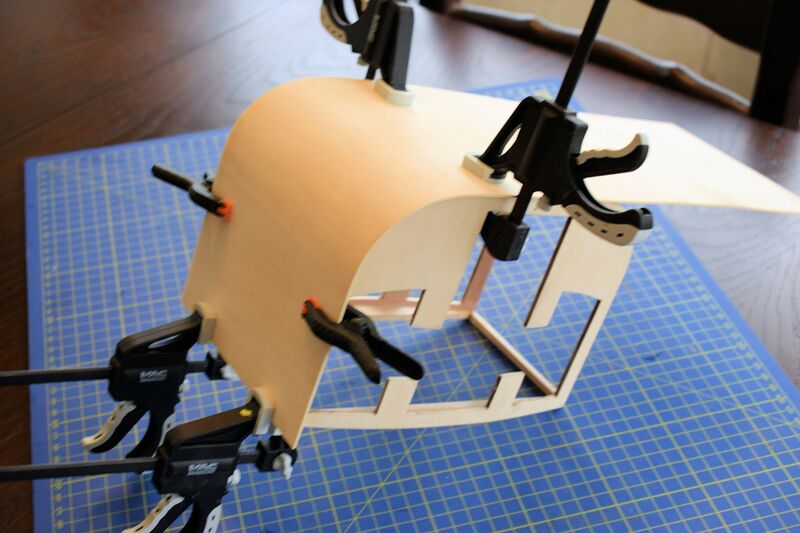 Interesting stuff Trev and a great insight into the techniques you are using for building this model, well done. I'll look forward to your next update with bated breath! Lining the interior and floor of the box. 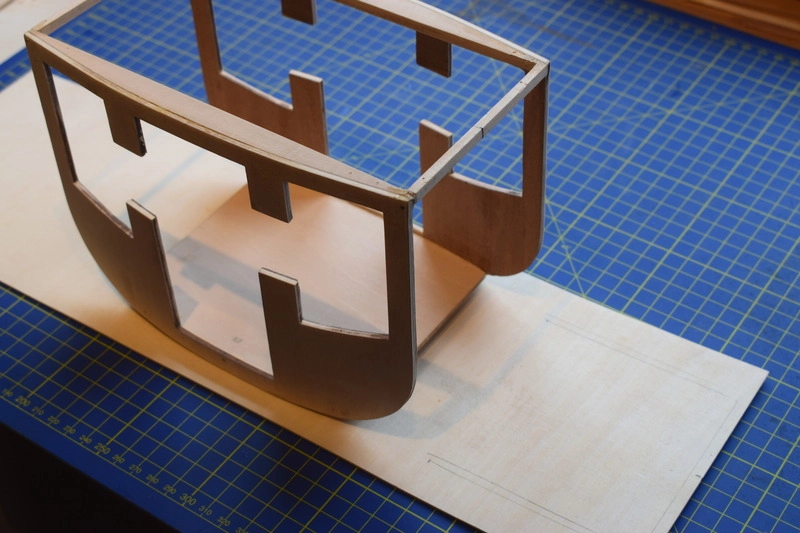 First I cut several pieces of 150mm of 0.6x30mm from sheet to line the interior part of the curved wall and then cut several pieces of different sizes to line the interior of the side beams and floor. Next I cut four pieces to line the interior corners using a steel rule to cut the strips,glued in place and sanded down with fine paper. Placing the battens on the side beams of the box on its exterior part. This is to give the box a bulging effect by gluing different size pieces of 2x5mm basswood on there sides and sanding down to the edges. Very nice work Trev, this is going to look superb when its done. Thanks Alan and Daran, starting to get a feel for this model, it is like all the kits I have from De/Ago not only do you have to learn how to build them but you gain experience,plus you teach yourself it's history which stays with you.